Dear Dr. Hunt: This female scientist has something to say. And it isn’t that she loves you. 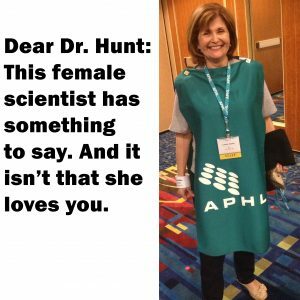 Posted on June 11, 2015	in All Posts, Workforce & Professional Development	with 1 Comment on Dear Dr. Hunt: This female scientist has something to say. And it isn’t that she loves you. After reading the comments made by Tim Hunt, the biochemist who won the Nobel Prize in Medicine in 2001 for his work on cell division, I was appalled! His comments about his “trouble with girls” (his words) in laboratories made me look back over my many years in research, academia, public health and clinical laboratories and remember the prejudice and tactless comments I experienced firsthand. Early in my career, there was my male lab supervisor who, upon seeing me bent over looking for something in a fridge, commented that my jumpsuit was “really attractive.” He clearly wasn’t looking at the jumpsuit! Then there was the time a male company rep tried to sell me a part for a piece of equipment and said, “Being a woman, you can’t understand how it works!” Needless to say, he didn’t get that sale and he never showed up to my university laboratory again. I didn’t stand for that type of treatment. So, Dr. Hunt, after all these years in science, I can truly say that no bouts of crying or lab love affairs (really?) have gotten in my way. I am still a scientist and so are both of my daughters. Despite the few people like you who think we can’t handle science because of our gender, we can and we have – and we hope to inspire the next generation to do the same.